1. Create card base from cardstock. 3. 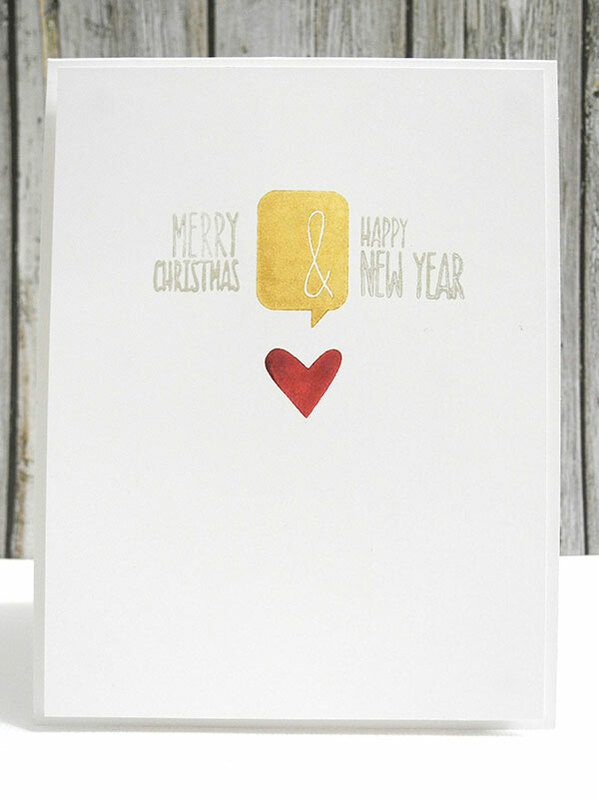 Stamp Merry Christmas, ampersand speech bubble, Happy New Year, and heart. 4. Adhere panel to card with foam tape. 1. Create card base from green cardstock. 2. Trim white panel, adhere to card. 3. Trim patterned paper strip, adhere to card. 4. 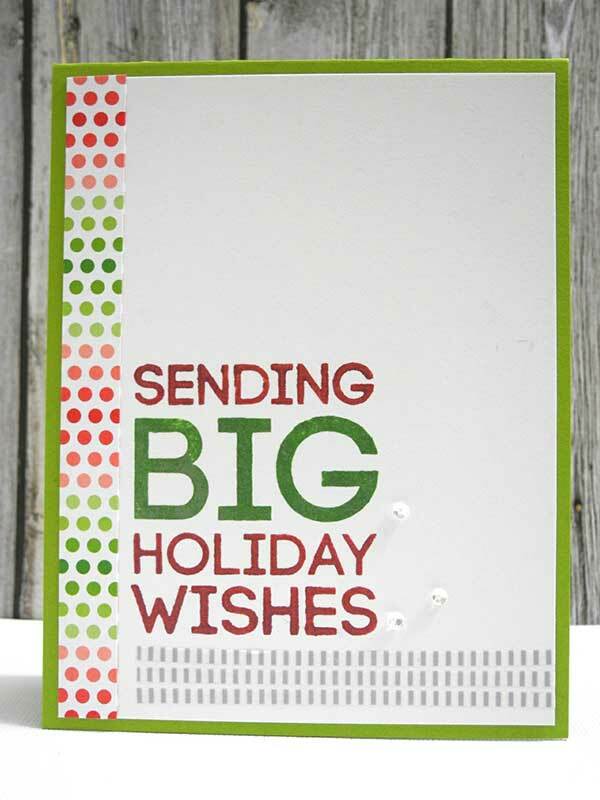 Stamp “Sending Big holiday wishes” in two colors of Brilliance ink. 5. Adhere three strips of washi tape. Welcome to IMAGINE Crafts’ third day of of our product swap featuring the “Joyeux Noel” paper collection from Ruby Rock-It. Our Artists In Residence will be sharing their Holiday inspired projects with you all week so make sure that you stop by daily for inspiration! 1. Create card from cardstock. 2. Cut white panel, stamp polka dot background with London Fog ink. 3. Affix gem strips to panel, adhere panel to card with foam tape. 4. Affix toy soldier stickers. 5. Tie bow in gold string, adhere to card. 6. Stamp sentiment piece with London Fog, Teal Zeal, and Rhubarb Stalk. Die cut. 7. Adhere to card with foam tape. Step 1 Create card base from cream cardstock, round corner. Step 2 Trim patterned paper panel, round corner, adhere. Step 3 Trim striped paper strip, adhere. Step 4 Trim journaling card from patterned paper. Step 5 Second Generation stamp the tree in London Fog Memento ink. Second generation means stamp the image first on a scratch piece of paper, then stamp onto the patterned paper. Step 6 Stamp “Joy” with Memento Luxe Rose Bud ink over the tree. Step 7 Trace JOY with glitter brush. Step 8 Adhere a strip of silver glitter paper to card. Step 9 Adhere journaling card with foam tape. Step 10 Tie bow and adhere over journaling card. Step 1 Trim natural cardstock panel. Stamp leaves with Kaleidecolor ink. Step 2 Trim banner from craft cardstock. Step 3 Pick up brown ink from Autumn Leaves stamp pad with an InkBlusher to ink rubber stamp. Step 4 stamp sentiment and adhere with foam tape. Step 5 Create a card base from kraft cardstock. Adhere panel to card. Be sure to visit the Imagine Crafts’ Blog tomorrow as we kick off our Blog Hop with Spellbinders and their other Preferred Product Partners to give you ideas for the Holidays. Imagine Crafts will be featuring projects and tutorials each day for inspiration, along with your chance to win the Blog Hop Grand Prize featuring products from Imagine Crafts, Spellbinders, Fun Stampers Journey, Just Rite Papercrafts, Want2Scrap, The Stamp Doctor and Heartfelt Creations. Step 1 Press tree into Delicata ink to cover entirely with ink. Allow to dry. Step 2 Add red glitter glue decorations on tree. Allow to dry. Step 3 Adhere clip to back of tree. Remove box lid and affix washi tape. Step 4 Add Washi Tape to top of box. Step 5 Place lid on box. Step 6 Tie ribbon around box, tie bow. Step 7 Attach wood embellishment to bow.